Bonn is located in the south of North Rhine-Westphalia. With 318,809 inhabitants, Bonn is one of the 20 largest cities in Germany. Its a very beautiful city with old building and a castle which is the headquarter of university. In Bonn we collaborate with all major rental car companies and therefore are able to offer good rates. Driving a rental car through Bonn offers you the ideal opportunity to explore the city - whether for business or pleasure. Bonn is easy to reach by train, car and airplane. If you would like to travel by plane, Cologne/Bonn Airport is the ideal place to do so. If you would like to start your rental car journey directly at the airport, simply use the Car RentalCheck price comparison. This way you can choose the most favourable offer for you and book not only informative but also reasonably priced. Simply enter the airport as the desired pick-up station for your rental car. There are many car rental companies at the airport. From Cologne/Bonn Airport (CGN) you can quickly reach the city centre of Bonn or, of course, Cologne thanks to your own car. In 1989, during the fall of the Berlin Wall, Bonn celebrated a big anniversary. This was the city's 2,000th birthday, where a Roman camp was already in pre-Christian times. Bonn gained even more importance when it later became the residence of the archbishops of Cologne. And in 1949 Bonn finally even became the capital of Germany before the federal politicians returned to Berlin in the course of reunification. Nevertheless, there are still parts of federal ministries and a number of supreme federal authorities in Bonn's city centre and the surrounding area. Accordingly, Bonn today bears the unique title of a "Federal City", unique in Germany. Of course, many buildings have survived from the times when the fortunes of West Germany were steered from here. This applies both to the former seat of the German Parlament (Bundestag) and to the former Federal Chancellery. The waterworks, which in the meantime has been converted into a parliament building, and the Palais Schaumburg can still be visited from the outside. To explore this part of Bonn, it is advisable to park your rental car in one of the multi-storey car parks near the Rhine. Afterwards, you can take a walk along the banks of the Rhine. The city centre of Bonn is also worth a stroll. A good starting point for this is the historical marketplace of Bonn, where many traders still offer their groceries and other offers for sale and where the car can be conveniently parked in the parking garage. The architectural centrepiece of the market square is the Old Town Hall, which was built between 1737 and 1738 in the rococo style and where one can still marry today in historical rooms. The rental car can initially remain in the multi-storey car park, as a number of other attractions are within walking distance. This applies especially to the birthplace of the city's most famous son. In December 1770, the famous composer Ludwig van Beethoven was born here, which is regarded by many experts as the greatest genius in the history of music. In the Beethoven House there is a museum dedicated to the life and work of Beethoven. Another important place to visit is the Elector's Palace with its adjoining courtyard garden, which today serves as a public park. Parts of the Rheinische Friedrich-Wilhelms-University are now housed in the castle itself. Bonn is well connected by highway to other cities in Germany. Therefor you can reach the city easily with your rental car. There are also a number of important museums in Bonn. The most important museum is still relatively young. It was founded in 1994 by the then Chancellor Helmut Kohl and is dedicated to the history of the Federal Republic of Germany since 1945 as a "House of History". 7,000 exhibits and 150 media stations on 4,000 square metres illustrate the development of Germany after the end of the Second World War. Among the exhibits there are the original Mercedes limousine jused by the German chancellor, Willy Brandt's Nobel Prize certificate and the sneakers that Joschka Fischer wore when he was sworn in as the Minister of the environmental affairs for the first time. On rainy days, you can also visit the Zoological Museum König, the Egyptian Museum of the University of Bonn, the Rheinische Landesmuseum, the Art Museum Bonn and a number of other permanent exhibitions. For the evening programme, a visit to one of the Bonn theatres or the Bonn Opera House is a good option. If you're tired of history and culture at this point, you can also park your rental car in a multi-storey car park in the city centre and take a walk from there to see the offers of the Bonn retail trade or simply enjoy a cup of coffee. A walk of this kind is also a real eye-catcher, because Bonn has preserved a large number of buildings with façades dating back to the Wilhelminian period, which give many streets in the city centre a special touch. The gastronomic offer of the city of Bonn also stands up to comparison with other major cities and ranges from local food to Thai as well as from inexpensive to highly exclusive. Anyone who has ever been to this area should not forget the Rhine wine. Before enjoying the same, however, it is advisable to bring the car back to the hotel first, as the fine taste of these drops rarely remains with just one glass. The region around Bonn is also full of tourist attractions. First and foremost, the largest city in North Rhine-Westphalia is Cologne. At least once in your life you should have seen the magnificent building of the Cologne Cathedral for yourself. By car, you can quickly reach Cologne via the motorway and can park your rental car there conveniently close to the city centre. Like Bonn, the even larger city on the Rhine looks back on a history that goes back to Roman times. While the past is often present in Bonn, Cologne's offerings are rooted much more in the present time than in the fifth season with the Rhenish carnival. Like Bonn, Cologne also has a number of important museums. The Roman-Germanic Museum, the Museum Ludwig or the Imhoff Chocolate Museum are just a few examples. Cologne also has appropriate offers for travelers travelling with their families in a rental car, such as a visit to the Cologne Zoo. Bonn is located in the Rhine Valley in one of the most beautiful areas of North Rhine-Westphalia for many people. If you have a rental car, you can explore the Rhine Valley by car from Bonn. The most beautiful part of the river begins practically beyond the city limits of Bonn. After only a few kilometres you leave Nordhrein-Westfalen at Drachenfels and reach the neighbouring state Rhineland-Palatinate. There are many historic walls on the mountains and rocks to the left and right of the river. Koblenz offers a beautiful destination, where the Moselle flows into the Rhine at the "Deutsches Eck". Since many places along the river can not be reached by public transport, a rental car is highly recommended. After a successful tour of discovery, you can then return by car to North Rhine-Westphalia. Here you can take a detour via the Eifel region, whose volcanic hills give the area a unique landscape character. 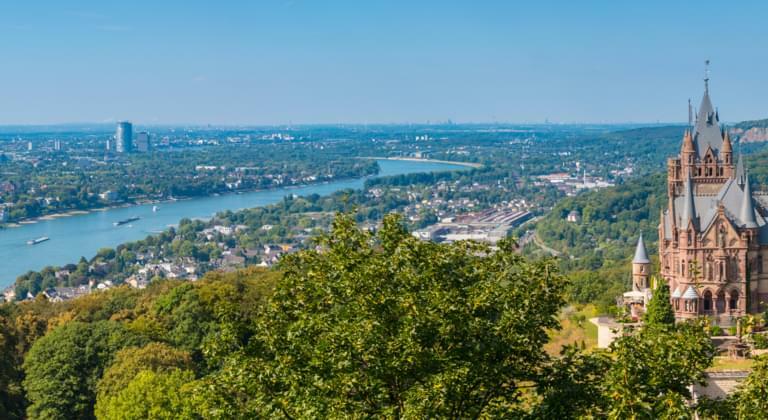 The same applies to the hills of the Siebengebirge, situated on the other side of the Rhine from downtown Bonn, which also invites you to take a joyride by car. When the sun shines, the car can be a convertible to enjoy the good air, the even better weather and the beautiful views. It is worthwhile to rent a car for your stay in North Rhine-Westphalia and to compare the offers on the Internet in advance in order to book the Bonn car rental at a reasonable price. When returning your rental car at the local car rental company office, simply follow the contractual rules laid down in the rental conditions. No matter whether you want to hand in your rental car at one of the stations in and around Bonn, make sure that you adhere to the point of return, return time, return date and return station - as listed in your individual offer. Simply start the Driveboo price comparison by yourself and convince yourself of our good offers. With your rental car you are flexible and independent of public transport. So you can discover Bonn and its surroundings and its many highlights on your own. And if you are unable to make a short-term booking - no problem - in this case you will benefit from a free cancellation up to 24 hours before the rental date.